I’ve been watching Media Matters fake concern over the Reid-supporting chick punched at a townhall forum this week. 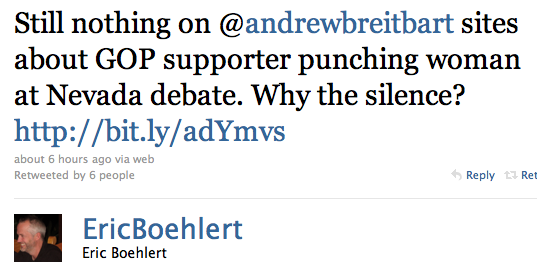 Suddenly Eric Boehlert is a defender of women. Except when those women are conservative, because hey, Kelly Owens and Allee Bautsch TOTALLY had it coming, right? What? That bastion of media purity, the calvary to the rightwing media, the Soros-funded “media” outlet didn’t have anything about the assault of conservative Kelly Owens? OK, so I imagine that they’re hurriedly drafting a post now to remedy that glaring oversight, since, afterall, they’re such huge defenders of women all of a sudden. I figured that Media Matters/Eric Boehlert/George Soros would also have written about the severe beating of Allee Bautsch, too, right? That’s ‘No for $200,’ Alex. 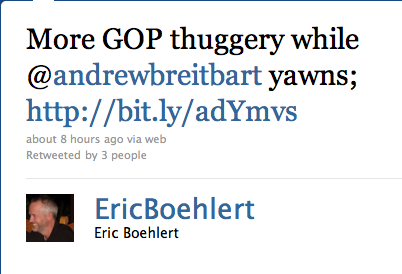 Oh, wait, sorry, MMfA did mention Bautsch’s name in an attack on Jim Hoft. So, that’s something, right? So why, after all this time, nothing on MMfA on either Owens or Bautsch? Why the silence? Why the double-standard? – More lefty assaults, lefty screeching and intimidation, threats of assault, advocating violence, hateful rallies. Meanwhile, the tea parties repudiate any such things. Violence in lieu of discourse is wrong, period. Party, ideology is irrelevant. Why are only the conservatives saying this, though? Maybe Media Matters can do a story on it. For the sake of argument I’ll play devil’s advocate for a moment. I get what he’s saying: he’s saying essentially “let me be clear, we’ll do whatever we can to prevent another 9/11 but worst case scenario, if another one were to happen, we would recover, just as we recovered from 9/11. Whatever kills you doesn’t make you stronger!” And then Kayne would come out singing his bastardized Daft Punk track and boo-yah, another party at the White House. This isn’t the biggest capslock OMG moment for me, from advance excerpts of the book, it seems as though Obama is committing the same faux-pas liberals allege that Bush committed in not listening to his generals. That is a bigger problem, especially coupled with the admin‘s inability to acknowledge radical Islam as the fuel for terrorism. Are we doing everything to keep America safe? We can’t even acknowledge the enemy’s motivation. Perhaps she’s jealous of Mrs. Obama’s incessant vacations while the country writhes in economic turmoil? If what Bruni alleges is true, of course Mrs. Obama would hate the job because the glitz has worn off now that her husband’s approval ratings are in a death spiral. Until now I hadn’t formed an opinion of Ms. Bruni-Sarkozy, but now I find her to be as loose with her discretion as she was with her body back when she was younger and not resigned to kitten heels because stilettos were ill fitting of a woman her age – even if I share her implied shock of such an admission from the First Lady. The swipe at the mother of Mr. Sarkozy’s children is embarrassingly tacky as well, but nothing shocks me from a woman willing to humble the status of the French first lady by putting out a comical little folk album. Relatedly, remember how we were told that if Obama was elected he’d win prom queen of the world and Europa would respect us again? Not so much? Like bats out of hell. A handful of House Democrats are making health care reform an election year issue — by running against it. At least five of the 34 House Democrats who voted against their party’s health care reform bill are highlighting their “no” votes in ads back home. By contrast, party officials in Washington can’t identify a single House member who’s running an ad boasting of a “yes” vote — despite the fact that 219 House Democrats voted in favor of final passage in March. AP: Say, guess what we just found in ObamaCare! Pinal County Sheriff Paul Babeu said requests by Arizona law enforcement personnel and Sens. John McCain (R-Ariz.) and Jon Kyl (R-Ariz.) for 3,000 National Guard troops along the state’s border with Mexico have been answered so far with 1 percent of that number deployed there this week. But the federal Bureau of Land Management (BLM) has placed 15 signs along a 60-mile stretch of Interstate 8 that links San Diego with Phoenix and Tucson warning travelers of drug cartels and human trafficking operations. “BLM Encourages Visitors To Use Public Land North of Interstate 8,” the signs say. A handful of signs and 20 National Guard troops! FTW! I’m trying to figure out why so few of the initial National Guard request were sent. It’s within the governor’s jurisdiction to call out the Guard (i.e. when Bush was criticized for not getting the National Guard in LA after Katrina when really, it was the gov’s lawful responsibility to do so and had Bush superseded this some would have made it a states’ rights battle); by all accounts Gov. Brewer made the request for the Guard but why so few sent? It would seem that the hold-up isn’t with her authority, but rather perhaps with the Defense Department. Homeland Security Secretary Janet Napolitano announced in July that the deployment would commence Aug. 1, but National Guard officials later said that date was meant only to reflect when troops would begin training. In March 2009, Brewer wrote to the Defense Department requesting 250 additional soldiers for Arizona’s Joint Counter Narco-Terrorism Task Force, which already uses National Guard personnel. About 30 troops will start their jobs on the border Monday, and waves of more troops will be deploying every Monday until all 532 are expected to be on the Arizona border by the end of September. In May, Obama ordered 1,200 National Guard troops to boost security along the border. Brewer has been a sharp critic of the National Guard deployment, saying the troops aren’t enough and that Obama should have sent 6,000 along the border, half of them to Arizona. But in March 2009, Brewer wrote Defense Secretary Robert Gates asking for 250 National Guard troops, less than half the amount now being sent. I have to say, given the current state of things near the border, I agree with Gov. Brewer and Sheriff Babeu. The Department of Defense needs to get serious about border security. Too little only exacerbates the problem and sends worse than a weak message to those placing bounties on the heads of US law enforcement. Union leaders will unleash a concerted attack against Republican candidates and their “right-wing agenda” beginning this Labor Day weekend as they rally to stem expected Democratic losses in November’s midterm elections. Mr. Trumka said the federation will play roles in more than 400 races nationwide, promoting its election agenda with a “massive mobilization” in 26 states. It will focus on 70 House races as well as Senate, gubernatorial and state legislative contests. If unions are worried about jobs, perhaps they should stop supporting party policies that lead to job destruction – or lack of construction … jobs, that is. No word on how that approach figures in the US Constitution. For the neophytes: who is Stone?